The outcome is anything but predictable when an exhausted hotel guest sets out in search of sleep in this kid-pleasing romp full of visual humor. Will Mr. Snore ever get some shut-eye at the busy Sharemore Hotel? The room on the first floor is too noisy. The room on the second floor is too crowded. The room on the third floor is too damp. Everywhere Mr. Snore goes, with a dutiful bellhop leading the way, he encounters something that’s bound to keep him awake. Why is it so hard to find some peace and quiet? 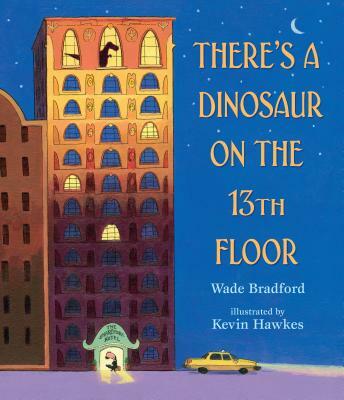 Perhaps Mr. Snore will have better luck on the thirteenth floor. . . . From author and playwright Wade Bradford and award-winning illustrator Kevin Hawkes comes a laugh-out-loud tale that plays with expectations and revelations — and reveals a surprisingly thought-provoking final twist. Wade Bradford teaches English at Moorpark College and is the author of Why Do I Have to Make My Bed? and Around the World in a Bathtub. Along with picture books, he has written more than thirty-five plays. Wade Bradford lives in southern California, where he enjoys "napping, snoozing, and occasionally snoring." Kevin Hawkes is the illustrator of many books for children, including the award-winning Library Lion by Michelle Knudsen; A Little Bitty Man and Other Poems for the Very Young by Marilyn Nelson, Pamela Espeland, and Halfdan Rasmussen; and The Three Mouths of Little Tom Drum by Nancy Willard. Kevin Hawkes lives with his family in southern Maine. The bellhop’s unflappability comically contrasts the hotel guest’s escalating exasperation as they climb the stairs to one room after another, encountering dangling spiders, giraffes, and a mazelike hamster colony...Acrylic and ink pictures by Hawkes (Imagine That!) amplify the tale’s humor with such playful flourishes as snakes wrapped around the art-deco hotel’s pillars, a rodent perched on a chandelier, and Mr. Snore and the dinosaur’s matching pince-nez and bunny slippers. A fun addition to bedtime-themed books that is perfectly suited for one-on-one or small group sharing.